When you're looking for family fun, it's hard to beat the caliber of attractions that Orlando, Florida, has to offer. Whether you're into roller coaster thrills, animal adventures or delicious foods, Orlando is bursting with adventure. If there's one thing Orlando is known for, it's theme parks. The most famous is Walt Disney World. The resort is comprised of four separate theme parks, two water parks, multiple hotels, a shopping district, and more. 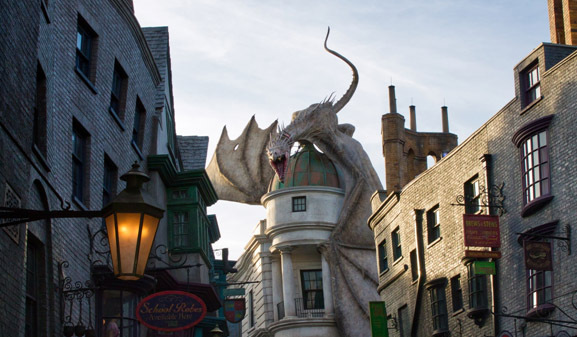 Universal Orlando Resort includes two theme parks, each of which has an entire section dedicated to Harry Potter. If you want thrill rides based on the most popular films of all-time, Universal is the theme park for you. In addition, the Orlando area is home to Legoland Florida Resort, SeaWorld Orlando, and two Fun Spot America parks. Even if you’ve been to see the Mouse in the past, there’s always way more to see in Orlando. If you're into wildlife, Orlando has many attractions that will appeal to you. Gatorland has not only alligators, but also crocodiles and panthers. At Safari Wilderness Ranch, you can explore acres of land populated by lemurs, zebras, and other wild animals; you can take a vehicle tour, ride a llama, or go on horseback. The Central Florida Zoo and Botanical Garden has both plants and animals that will be sure to amaze. In addition to viewing giraffes, insects, big cats, reptiles and more, you can also stroll through 23 acres of luscious gardens. For another botanical experience, visit the Bok Tower Garden. The property includes a 20-room house, a 205-foot tower, and almost 50 acres of gardens. This includes a children's garden, where your kids can climb, balance, explore, and even play in the water. Orlando has many scenic areas, and a tour is a great way to see some of them. For example, a trip with Gray Line Orlando Tours will give you a chance to see the downtown area. On a ride with Winter Park Scenic Boat Tours, you'll float through some of the area's canals and view impressively large houses. If you'd rather see the wild side of Central Florida, take a tour of the Florida Everglades with Boggy Creek Airboat Rides. Those who aren't into boat rides may prefer the land-based Wild Coach Adventure Tour instead. Although there are plenty of fast food options in Orlando, especially in the tourist-heavy areas, there are also one-of-a-kind eats here. On a trip to Central Florida, be sure to experience at least a few of these. Area residents are big on locally sourced food, and fresh seafood is plentiful here as well. You'll find great menu selections at The Ravenous Pig, MoonFish, and Dovecote Brasserie. There are even delicious restaurants in the theme parks. For example, you can eat at Tiffins at Disney's Animal Kingdom or try out Morimoto Asia at Disney Springs. When you visit Orlando, be sure to stay near the fun. When you're looking for hotels in Orlando, pick one that's close to your favorite theme park, such as Hyatt House Orlando/Universal. If you're looking for a central location for your Orlando adventures, consider staying on International Drive, home to shops, restaurants and the ICON Orlando observation wheel. It's time to start making plans for your next family vacation to Orlando. You're sure to have a great time together as you explore the many sights and attractions that this Florida city has to offer.